The Seventh Kingdom’s combat system is designed around boffer weapon combat, which can include the use of shields for both defensive and offensive attacks. There are a few things to cover when talking about shields in Seventh Kingdom IGE. In an effort to make the game more balanced and enjoyable for everyone, shield sizes at Seventh Kingdom are based off of a percentage of a players individual height. This means the taller you are, the larger your shield can be. In essence, your max shield size is forty percent of your height. The system is fairly simple. Find your height on the table below. Example: If you are 68 inches tall, you can use shields that are red category or smaller. You can use red, blue, green, and grey color coded shields. You can not use purple, orange or yellow shields as they are too big for you to carry within the rules. The shield sizes listed above are the shield’s maximum dimensions (i.e. their maximum diameter, length, width and diagonal length). 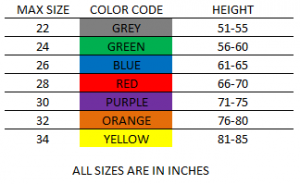 During the sign in process, everyone is given a color associated to their individual height bracket, which in turn will be recorded on all of their character cards. Meanwhile, all shields will be rated one of the seven colors during inspection. They will be marked with the appropriate color by an official game marshal, in the form of a small colored square of duct tape, complete with game marshal signature and date. This square will go on the back of the shield as not to detract from the environment, or damage the front of the shield. The colors are in order of our component variations, to make remembering easier. Any height outside of these ranges will be addressed separately. Why did this rule happen– This rule allows staff to better challenge our players without drastically increasing shield breaking / defeating effects across the board. It also reduces the frequency of turtling issues (where someone is impossible to attack in melee because their shield is larger than they are). This change was made effective at the start of 2016. We thank you for your cooperation and understanding. What ‘kinds’ of shields are allowed? – We allow both homemade shields (often made of bread trays or plywood) and most commercial latex shields. However, more importantly we ask, is a shield safe to use in boffer combat? A shield should have padded edges, and be free of any sharp or pointy objects that may damage weapons or injure fellow players. Shields that are easily breakable, or are made of dangerous materials when broken will also not be allowed to enter the game. It is for this reason that all shields are subject to the same inspection rules as weapons: In order to be used, the shield must be inspected by a staff member every season (Winter:Dec-Feb, Spring:Mar-May, Summer:Jun-Aug, Fall:Sep-Nov) and providing the shield is deemed safe at its first event, it will be given an item tag. How do I use a shield and what can it protect me from? -To use a shield in combat you must have the appropriate shield proficiency and wear it on your arm; if a shield is on your back or chest it will not protect you. A properly worn shield will protect you from melee weapon, thrown weapons, or ranged weapons (unless there is a feat used specifically against the shield). A shield will not defend against magical attacks (spells), elemental oils (alchemy items), traps (environmental or made by an artificer), or global effects (called by a game marshal). What shapes/sizes of shields are allowed? – We allow everything from round shields, to tear drop shields, to bucklers, to punch bucklers. – While wielding a shield, the arm using a shield is unable to wield a weapon. ‘Turtle-ing’ or ‘hiding’ is a practice in which shield users duck behind their shields leaving only their heads available to strike. ‘Shield Bashing’ or slamming with a shield is unsafe due to the fact that the shield faces are not properly padded for shield to body contact. How do I make a boffer shield? – You can find the official Seventh Kingdom Shield How To here.